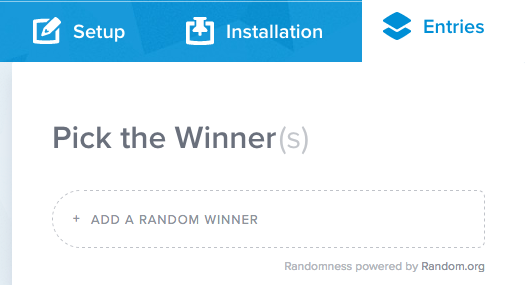 Rafflecopter is a FREE tool available to run giveaways on your blog/social media. I have been using it for a few years now and have to say, I love it! The possibilities are endless. Here is my step-by-step for how to run a giveaway. 1 - Visit www.Rafflecopter.com and click 'new giveaway'. 3 - Viral Sharing is only available for the paid-for version of rafflecopter so skip this part. 5 - I don't usually include 'Visit a FB page' as there is no guarantee the entrant will go on the page so it feels like a bit of a waste (plus Facebook isn't a focus for me at the moment). It is easy to do though, just click 'Visit a fan page' and type the page name in the top box and the page URL in the second box. Then hit save. 6 - I always use 'follow an account on Twitter' and usually add both the brand and my own Twitter accounts as two separate entries. I give each entry 2 points. 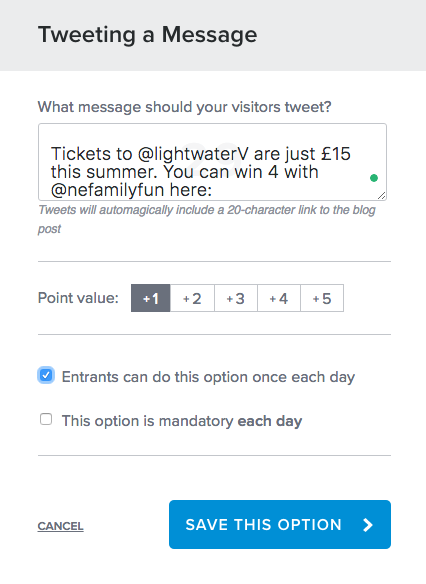 7 - I ALWAYS include Tweeting a message as an entry option and I tick the box that allows entrants to do this daily. You only have 120 characters so it can be tough to fit everything in but generally, I try to include a little about the brand's message (eg if there are discounted tickets this summer or that they have a lovely shop with beautiful items for sale for Mother's Day). I will always tag the brand who may wish to interact with the giveaway Tweets and I tag my own Twitter handle too as this helps with Klout. Rafflecopter will automatically add you blog link to the end of the Tweet. 8 - There are other options which are pretty self-explanatory. In the past, I've had people complain that they don't have any social media other than Facebook so I think adding the option to comment on the blog post is always nice so you don't alienate anyone and maximise your entries. I always try and think of a question related to the brand and that will give different and varied answers - eg What is your favourite ride at Lightwater Valley? 9 - The 'invent your own option' is fantastic and in my opinion, underused. I usually use this option for entrants to subscribe to my Youtube channel or follow me on Instagram. Other options could be to like and comment on a particular Facebook post (then you can invite them to like your page - I think this is a better option than the standard 'visit our Facebook page). 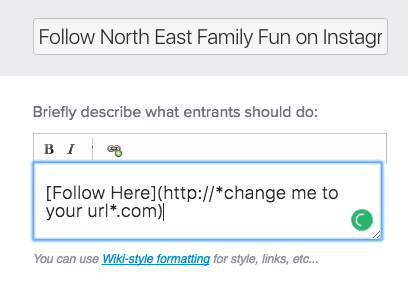 If you can add a link, it can be verified and doesn't break any rules, you can be as creative as you like. 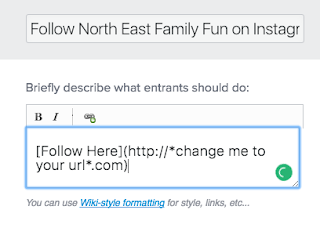 3 - Change the 'Http://' part to the link you'd like. 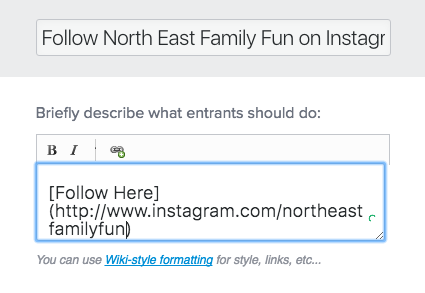 This could be your Instagram Link, YouTube Channel of a link to a specific Facebook post. 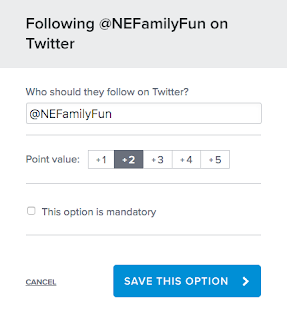 4 - When you save this link, 'Follow Here' will be changed to a clickable link. 10 - Now you need to change your giveaway start and end dates. With the free version, you can only start/end a giveaway at midnight. I always end my giveaway on a Sunday night (at midnight) and to do this you actually need to click the following Monday's date. 11 - Don't forget to complete your giveaway Terms and Conditions. These need to be carefully completed. Rafflecopter has a fantastic guide to terms and conditions here. 12 - Now at the bottom of the page, you are ready to 'preview and install'. Here you can check that your giveaway actually looks ok and that the links are all ok. To embed the giveaway into your blog post, simply copy and paste the code into the HTML of your blog post. The giveaway won't show up until you hit post preview. 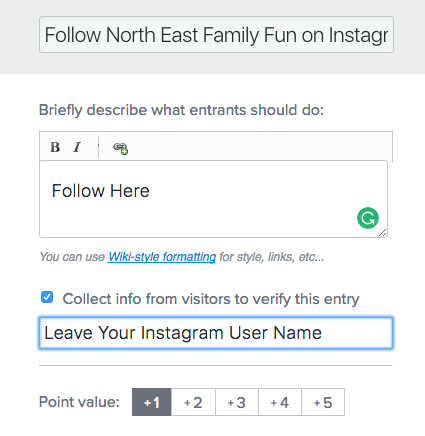 When adding to a blog post, it is best practice to have the giveaway terms and conditions in plain text as part of the blog post too. You can also add the giveaway directly to your Facebook page using the 'Run on a Facebook page'. This is nice and easy to install and will give you a 'giveaway tab' on your Facebook page. 13 - Almost done! Now it's time to promote your giveaway. I normally promote my blog post in the normal ways and then add a link to the post to the SuperluckyMe linky, Loquax and Prize Finder. 14 - Once your giveaway has ended, you simply need to head to the 'entries section' and select 'pick a winner'. Rafflecopter will randomly select a winner and let you know how the winner entered - I always manualy verify this (eg if it says they follow me on Twitter, I check this is the case) and then if all is ok, I 'announce winner on widget' so anyone who comes back to the giveaway can see that a winner has been selected. I then copy the winner's email address and send them and email congratulating them & reminding them of them of their prize. I copy the brand PR into the email and explain something along the lines of 'Jane from Lightwater Valley will be in touch in the next few days to organise your prize'. This is easier than sending multiple emails I find. 15 - You can export your giveaway data to excel if needed, Rafflecopter will email you the entries in a nice spreadsheet. If a brand asks for this, you need to make it very clear in your terms and conditions that your data will be used this year. 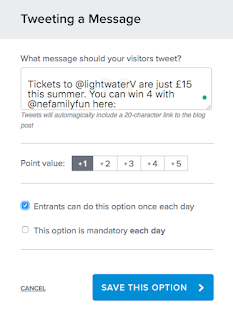 You can also add to the terms and conditions that by entering the giveaway, the entrant agrees to sign up to your own mailing list but can opt out at any time. Handy feature if you wish to gain subscribers - I can't stress enough though that this needs to be made very clear in your terms and conditions before the giveaway begins. This is ACE! 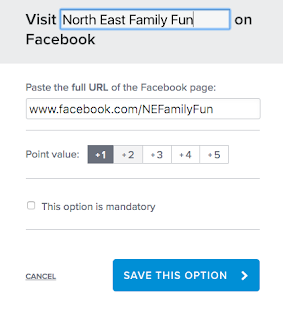 So many tips that I'm not doing yet - the option to like and comment on a Fb post as a create your own option is golden! And adding to t&cs that they opt in to mailing list is great idea. Great job! V helpful guide. Pinning!